“When someone has a talent, it is not to be kept to himself but to be shared with others. And the person or persons with whom he shares this talent should also be willing to pass on the legacy to others as well. “This is one of the ways by which we can help to build a positive community,” says Chris Lindsay, popularly known as “Toes,” from Bon Accord. For the last 25 years, Lindsay has been involved in the air conditioning and refrigeration business. He dropped out of school at age 13 after struggling with academics and being considered a slow learner. He went to a trade school where he was taught auto mechanics. After a short time, however, he abandoned this trade and started to learn carpentry instead. When he had completed his studies in carpentry, he got a job as a carpenter, working for several years in the construction industry. Then came the downturn in the economy and Lindsay lost his job. He took to going to Store Bay beach to cool out. While there one day, he met up with a friend by chance, and his life took a turn, he ended up in the air condition and refrigeration business, now owner of “Toe’s Kool Centre in Bon Accord. 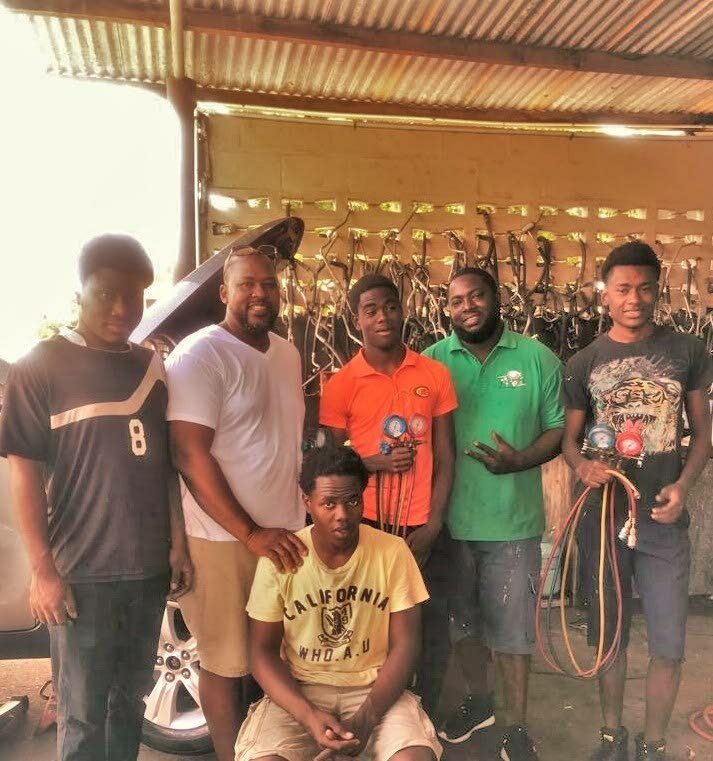 Recounting his story in an interview with Newsday Tobago, Lyndsay recalled how his frustration with academics led to his heading off to the Tobago Institute of Education to learn auto mechanics, his move to carpentry and then losing his job in the construction industry. “N ow being at home with nothing to do, I would go to the beach at Store Bay, a place where I had always loved visiting because I love nature and just looking at the water, the birds and the beautiful scenery, gave me a peace of mind. “So, this special day as I visited the beach, I met one of my good friends by the name of Earl Stewart. We started talking and after maybe half an hour or so, he looked at his watch and said that it was time for him to return to work. I was surprised because I thought that he just came to relax as I did. “So, I asked him where he was working and what was he doing. He told me that he was working at one of the hotels in Crown Point doing air conditioning and refrigeration. It was the first time in my life that I ever heard about this profession. He asked me where I was working, and I told him that I was out of a job at the moment,” Lindsay said. “On hearing this, Earl invited me to go to the hotel with him and help him to take down an air condition unit, which I did quite willingly. What I saw that day really had me amazed. This man made an air condition unit which was blowing hot air suddenly starts blowing cold air. Barton sent Lindsay to Trinidad to further his studies in auto air conditioning and refrigeration after which he returned to Tobago to work with the company. After nine years working with Barton’s company, Lindsay left and started his own workshop in Bon Accord. He then moved the business to the front of his mother’s house, also located in Bon Accord, where he served his customers from under a big mango tree in the yard. Later he moved to the back of the house where he worked under a tarpaulin which was held together by two pieces of sticks. He has since built himself a proper workshop. He makes house calls to repair air-condition units and repairs refrigerators at his workshop. He also ventured into air conditioning for cars. Gaining valuable experience, and having an income after some years of being in this business, he decided to specialise in auto air conditioning, which he continues to do to this day. As a businessman, Lindsay sees himself as someone whom God has blessed with a special talent, and he takes pleasure in sharing this with others. Thanking persons who assisted him when he was a young man, he said this helped shape him into the individual that he is today and so he feels he had a duty r now to do the same for the youths in his community. Most of the employees at Lindsay’s garage are young men from the Bon Accord community. He teaches them a trade so they would not have any time to be idle and get into trouble. “I believe that as adults we must leave a legacy for the young ones so that they would have something that they too can pass on to the next generation,” he said. Lindsay also teaches employees from companies in Tobago whose are sent to his establishment for training. “I enjoy what I do. What gives me satisfaction in life is when young persons whom I have trained, are able to work and help themselves. I feel such a joy on the inside. To me this is what life is all about - making someone happy and helping them to fulfill their dream,” he said. Reply to "Grace in giving back"